Columban priest Paul Glynn, who works in the Philippines, provides a concise summary of the basics of Islam: the meaning of the words “Islam” and “Muslim”, the Six Articles of Faith, The Five Pillars of Islam, Islamic Law, “Jihad” and the divisions within Islam. Who needs to read this text? Every teacher, social worker, parish worker, priest, religious leader, community organizer, health worker…. Literally, as the title says, everyone!! We gratefully acknowledge permission from the author to publish this on columbanird.org. This is a new teaching unit based on the workshop module Basic Beliefs and Practices of Islam by S. Douglass, published by the Center for Contemporary Arab Studies, Georgetown University. The 16 page lesson provides an overview of major introductory topics required in survey courses, written for middle and high school level, or teacher preparation at lower levels. This is the website of Professor Alan Godlas from the Department of Religion at the University of Georgia (UGA). Clicking on headings or names of articles provides very easy links to a wide range of information on Islamic topics e.g. Quran, Sunnah, Sunni and Shiac Islam, Sufism, history, philosophy, women, terrorism, interfaith relations and many other contemporary issues. This is website of the Ahlul Bayt Digital Islamic Library Project (DILP). Clicking on the library “categories” on the right side opens up landing pages with a variety of articles and books and “fact sheets” on various topics. Of particular note is that the information is presented from the Twelver Shiac Islamic school of thought. This is the Arab Culture and Civilization site. It was originally sponsored by the National Institute for Technology and Liberal Education (NITLE) and is now sponsored by the Middle East Policy Council. It contains modules with summary information on Islam by acknowledged scholars. The pages of Readings are particularly useful. They contain basic information, introduction to the Holy Qur’an, development of Islam in history, political Islam in the 20th century. This is the website of the Australian Centre for Sufism and Irfanic Studies (ACSIS) whose purpose is “raising the awareness of people to the presence of God in day to day life using the teachings of Sufism.” It contains material on Sufism, psychology and the Enneagram. This is the website of the Centre for Muslim-Jewish Engagement (CMJE) of the University of Southern California (USC). It provides various search databases for the Qur’an (including three English translations) and some collections of Hadith. MuslimHeritage.com is a unique online education community of Muslims and non-Muslims seeking to advance human civilisation through the study of Muslim heritage. The website contains more than 1000 peer-reviewed articles, hundreds of short reports on news and events related to Muslim heritage research, and an interactive map and timeline. These Three Points were subsequently endorsed by other Muslim religious organizations. This consensus of scholars makes the ruling binding on Muslims and provides a basis for unity and a solution to infighting. It is good news for non-Muslims too, for preserving traditional Islam’s “checks and balances” will lead to balanced Islamic solutions for contemporary issues such as human rights, women’s rights, freedom of religion, and just and democratic government. It also exposes the illegitimacy of violent extremists and terrorists who can no longer claim jihad in the name of Islam. The Nineteenth Islamic Conference of Foreign Ministers (Session of Peace, Interdependence and Development), held in Cairo, Arab Republic of Egypt, from 9-14 Muharram 1411H (31 July to 5 August 1990), agreed to issue the Cairo Declaration on Human Rights in Islam which will serve as a general guidance for Member States in the field of human rights. Muhammad The Prophet is a documentary made by History Channel. It provides a brief biography for the Prophet of Islam, Muhammad (Peace be upon him). N.B. Other videos also available at this website. A two hour documentary on the life of the Prophet Muhammad. The Message, also known as Mohammad, Messenger of God, is a 1976 film directed by Moustapha Akkad about the life of Muhammad, the prophet of Islam. Inside Islam: is a documentary made by History Channel. It gives a basic introduction to Islamic religion from its beginning till nowadays. It’s suitable for people who explore Islam for the first time and know little about it. What is Islam? Who is Muhammad? This is a PBS documentary narrated by Ben Kingsley about Islam and attempts to answer these questions. The first part deals with the life of the Prophet Muhammad, his early life, his encounter with God Almighty and the birth of the Islam. Prophet Muhammad and the Rise of Islam. Islam would become the revitalizing force of a barbaric Arabia, returning people to God and bringing back the monotheistic message of Christianity and Judaism in its most powerful way. Islam Women were given rights over there husbands, racism was annihilated and the rich were made equal to the poor. The Awakening. This part relates the golden age of Islam. A time of great learning when Europe was steeped in the Dark Ages. The building of great works of architecture, reading, writing, mathematics, medicine, and astronomy. Even before the printing press Muslims would have hundreds of scribes writing all at once so they would learn and reproduce the writings. The Ottomans. This portion deals with the growing Ottoman Empire, which would control the bridge between 3 continents: Africa, Europe and Asia. This empire would begin at the close of the Crusades until World War I, from the 1300s to 1923. They would rule the entire Middle East and make there way into Europe. Before there was the state of Israel, there was great peace in the Holy Land regulated by the Ottomans. Denny, Frederick Mathewson. An Introduction to Islam. 4th ed. Upper Saddle River, NJ: Pearson Education, 2010. 1994. The book is specifically designed for graduate students. Its chapters treat the various areas that need to be covered in an introductory course on Islam. I recommend this book for anyone who wants a good, solid introduction to Islam. Also, for those who wish to pursue further studies in Islam, it is a useful book to have in your personal library for quick reference. Armour Sr., Rollin. Islam, Christianity, and the West. Edited by Paul F. Knitter, Faith Meets Faith Series. Maryknoll, NY: Orbis Books, 2002. Armstrong, Karen. Islam: A Short History. London: Phoenix Press, 2001. Esposito, John L. Islam The Straight Path. Oxford / New York: Oxford University Press, 1994. Reza Aslan. No God but God: The Origins, Evolution, and Future of Islam. New York: Random House Trade Paperbacks, 2006. Waines, David. An Introduction to Islam. Cambridge: Cambridge University Press, 1995. Armstrong, Karen. Muhammad: A Prophet for Our Time. Edited by James Atlas, Eminent Lives. New York: Atlas Books and HarperCollins, 2006. The author emphasises the psychological dimension. Emerick, Yahiya. The Life and Work of Muhammad, Critical Lives. Indianapolis: Alpha, 2002. A very dramatic account which keeps readers on the edge of their seats as the story unfolds from one crisis to the next. Guillaume, A. The Life of Muhammad: A Translation of Ibn Ishaq’s Sirat Rasul Allah. Karachi: Oxford University Press, 1955. This is an English translation of the classic Arabic biography of Muhammad by Ibn Ishaq (704-767) which survived only in copies by Ibn Hisham (died 833). It is a confessional account and includes much legendary material. Lings, Martin. Muhammad: His Life Based on the Earliest Sources. London: George Allen & Unwin Ltd, 1983. A devotional and confessional account of the life of the Prophet by a Sufi Muslim scholar emphasizing the spiritual dimension. It contains a lot of hadith material. Peterson, Daniel C. Muhammad, Prophet of God. Grand Rapids, Michigan / Cambridge, UK: William B. Eerdmans Publishing Company, 2007. The author’s focus is on drawing moral lessons for contemporary Muslims. An imaginative account in the best tradition of story-tellers, it makes a very engaging, human story. Watt, William Montgomery. Muhammad Prophet and Statesman. London, Oxford, New York: Oxford University Press, 1961. This is a summary of Watt’s two very detailed research works, Muhammad at Mecca and Muhammad at Medina, both published in Karachi by Oxford University Press. It is slightly dated but nonetheless a clear, readable, sympathetic but well-argued account of the life and times of the Prophet Muhammad grounded in solid research. Abdullah Saeed. The Qur’an: An Introduction. London and New York: Routledge, 2008. Abdullah Saeed. Interpreting the Qur’an: Towards a Contemporary Approach. London, New York: Routledge, 2006. Esack, Farid. The Qur’an: A User’s Guide. Oxford: Oneworld Publications, 2005. Mattson, Ingrid. The Story of the Qur’an: Its History and Place in Muslim Life. Malden, MA; Oxford; Carlton, Vic: Blackwell Publishing, 2008. Abdullah Saeed. Islam in Australia. Crows Nest, NSW: Allen & Unwin, 2003. Abdullah Saeed. Islamic Thought: An Introduction. London and New York: Routledge, 2006. Abraham, Antoine J. Another Look: One God and Three Faiths. Lanham, MD: University Press of America, 2014. Berkey, Jonathan P. The Formation of Islam: Religion and Society in the near East, 600-1800. Edited by Patricia Crone, Themes in Islamic History. Cambridge: Cambridge University Press, 2003. Brockopp, Jonathan E, ed. The Cambridge Companion to Muhammad, Cambridge Companions to Religion. New York, NY: Cambridge University Press, 2010. Doukhan, Jacques B, ed. The Three Sons of Abraham: Interfaith Encounters between Judaism, Christianity and Islam. Vol. 36, Library of Modern Religion. London: I.B. Tauris, 2014. Esposito, John L. Unholy War – Terror in the Name of Islam. Oxford / New York: Oxford University Press, 2002. Esposito, John L. The Future of Islam. Oxford, New York: Oxford University Press, 2010. Goddard, Hugh. “A History of Christian-Muslim Relations.” In Islamic Surveys, edited by Carole Hillenbrand, Edinburgh: Edinburgh University Press, 2000. Hussain, Jamila. Islam: Its Law and Society. 3rd ed. Sydney, NSW: The Federation Press, 2011. Jomier, Jacques. How to Understand Islam. Translated by John Bowden. New York, NY: The Crossroad Publishing Company, 1991. Kaltner, John. Islam – What Non-Muslims Should Know. Edited by John B Cobb Jr., Facets Series. Minneapolis: Fortress Press, 2003. Latifa. My Forbidden Face – Growing up under the Taliban: A Young Woman’s Story. London: Virago Press, 2002. Lyons, Jonathan. Islam through Western Eyes: From the Crusades to the War on Terrorism. New York: Columbia University Press, 2012. Lyons, Jonathan. The House of Wisdom: How the Arabs Transformed Western Civilization. New York: Bloomsbury Press, 2010. Michel, Thomas. A Christian View of Islam: Essays on Dialogue. Faith Meets Faith. edited by William R Burrows Maryknoll, NY: Orbis Books, 2010. Pratt, Douglas. The Challenge of Islam: Encounters in Interfaith Dialogue. Aldershot: Ashgate, 2005. Root, Michael, and James J Buckley, eds. Christian Theology and Islam, The Pro Ecclesia Series, 2. Eugene, OR: Cascade Books, 2014. Saikal, Amin. Islam and the West – Conflict or Cooperation? Houndmills, Hampshire and New York: Palgrave Macmillan, 2003. Siddiqui, Mona, ed. The Routledge Reader in Christian-Muslim Relations. London: New York: Routledge, 2013. Siddiqui, Mona. Christians, Muslims and Jesus. New Haven, Conn: London: Yale University Press, 2013. Van Gorder, A. Christian. Islam, Peace and Social Justice: A Christian Perspective. Cambridge, UK: James Clarke & Co., 2014. Volf, Miroslav, ed. Do We Worship the Same God? : Jews, Christians and Muslims in Dialogue. Grand Rapids, Mich: Eerdmans Publishing, 2012. Watt, William Montgomery. Muhammad at Mecca. Karachi: Oxford University Press, 1979. Watt, William Montgomery. Muhammad at Medina. Karachi: Oxford University Press, 1981. The World of Islam, Bulletin 2017, Vol. 49, No. 9/10 – September-October. The Secretariat of Ecumenical and Interreligious Affairs (SEIA) of the United States Conference of Catholic Bishops (USCCB) has conveniently compiled Vatican Council and Papal Statements on Islam from 1964 through to July 2015. They are available in the General Resources Section of the website. A Common Word Between Us and You – كلمة سواء is an open letter and call addressed in October 2007 to Pope Benedict XVI, to the Patriarchs of the Orthodox Churches, to the heads of the Protestant Churches, and to Christian leaders everywhere. It was originally signed by one hundred and thirty eight Muslim religious leaders, but the current signatories are well over two hundred and fifty. The Royal Aal al-Bayt Institute for Islamic Thought in Jordan are the inspiration behind the project. The Marrakesh Declaration addressed The Rights of Religious Minorities in Predominantly Muslim Lands: A Legal Framework and a Call to Action. It was the result of a conference held in Marrakesh on 25-27 January 2016, hosted by His Highness, King Muhammad VI of Morocco and jointly organized by the Ministry of Endowments and Islamic Affairs of the Kingdom of Morocco and the Forum for Promoting Peace in Muslim Societies, based in the U.A.E. It was attended by a large number of ministers, muftis, religious scholars, and academics from various backgrounds and schools of thought from Muslim countries and some representatives from other faiths. Oasis was founded in 2004 in Venice, out of an intuition of Cardinal Angelo Scola, in order to encourage mutual understanding and opportunities for encounter between the Western world and the Muslim majority world. Oasis studies the interaction between Christians and Muslims and the manner in which they interpret their respective faiths in the current phase of mixing of peoples, ‘hybridisation of civilisations and cultures’, stemming primarily from the experience of the Eastern Christian communities. The dimensions of this historical process are unprecedented and its dynamic unstoppable, and it needs to be oriented towards the good life at individual and community levels. The first part presents the origins of Islam, its main currents today, and its similarities with and differences from Christianity. The second part provides an overview of the history and present state of interreligious dialogue between Catholics and Muslims, both at the national and international levels, concluding with some suggestions on how everyone can contribute to such dialogues. “Christian Self-Understanding in the Context of Islam.” World Council of Churches, Current Dialogue, 52 (2012). This issue of Current Dialogue focuses on Christian Self-Understanding in relation to Islam. The first Islam consultation was held in Geneva in 2008 a year after A Common Word, which invited Christians to dialogue with Muslims on the basis of the shared, dual commandments of love of God and love of neighbour. This sparked intellectual conversations and also practical engagement in pressing social issues of conflict. 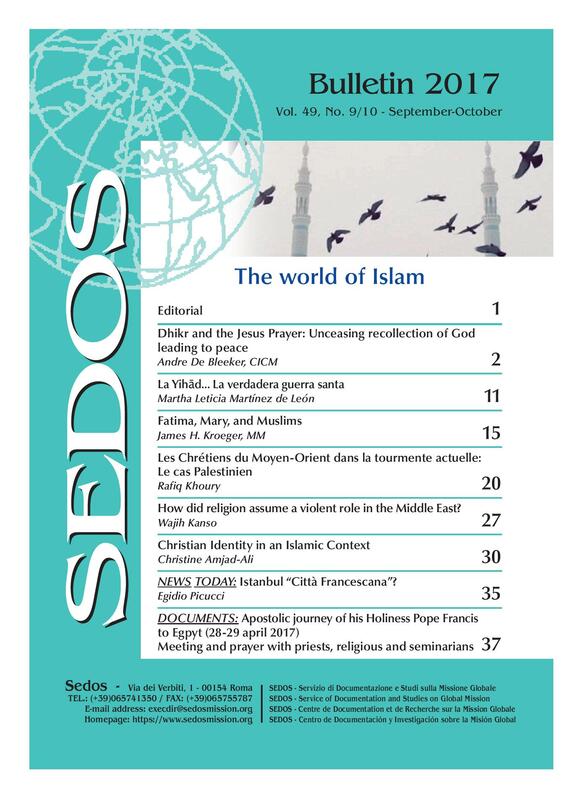 The papers provide a range of reflections across the spectrum of Christian-Muslim relations. The Christian Muslim Forum is building and sharing news of relationships between Christians and Muslims in England and beyond. It is a national body bringing the two faiths together in a significant way to improve understanding, interaction and partnership. Christian Troll SJ has made the text (and ongoing updates) of his book Muslims Ask, Christians Answer available on this website. The material consists of the questions that Muslims commonly ask of Christians, provides theological background and presuppositions involved in the questions, and indicates possible ways that Christians might respond that would be more readily intelligible and adapted to the mentality of the Muslim partner. The material is certainly not the starting point for conversation, but it is very useful background for the Christian involved in dialogue. When relations between Christians and Muslims have grown into maturity and the time is ripe, then these issues might become topics for fruitful foreground discussion. Christians and Muslims: Praying Together? This report was prepared by the United Church of Canada and approved by the 39th General Council 2006. It encourages reconciliation, understanding, and co-operation between United Church people and our Muslim neighbours. Congregations are encouraged to continue using the study guide as a basis for gaining a better understanding of the relationship of the United Church to Islam, and for engaging in dialogue with Muslim neighbours. O’Callaghan, Liam. “Christian-Muslim Dialogue in Pakistan: Responding Together for the Liberation of the Poor.” Catholic Theological Union, 2010. An internet search on “Islam” or on “Muslim” yields literally hundreds of results. Their value varies enormously depending on the authenticity of the sources, the quality of the scholarship, and the accuracy of presentation. Some are simply Islamic news services. Some are propagandistic, others apologetic, most are populist, many lack academic rigour, a few provide quality resources. Together they provide a window into the diversity of the Muslim world.